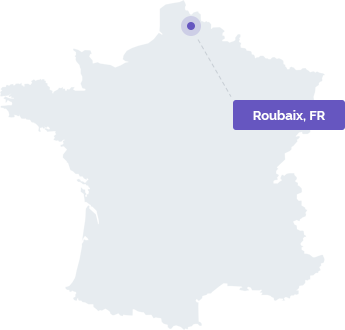 YourLastHost partners with OVH France to provide maximum uptime and affordability for French servers. Our France location is internationally compatible with ISO 27001:2005 standards to provide high availability servers. The Roubaix datacenter is known particularly for its ecological achievements, with almost no air conditioning and water cooling. YourLastHost offers many different services that are available in Roubaix, France, Europe. Virtual servers with instant deployment and tons of flexibility can be conveniently set up in France. Dedicated servers can be quickly set up and be ready for use in France.